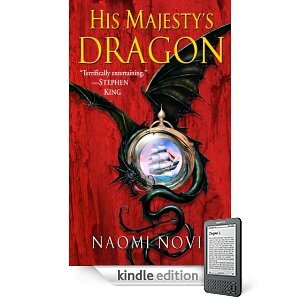 I recently finished the Kindle edition of His Majesty’s Dragon, by Naomi Novik. The book is the first in the Temeraire Series, named after the dragon introduced in the first book. While the series was originally supposed to be a trilogy, I believe it has grown to at least 7 books so far. The novel takes place in an alternate history universe, in the 19th Century, and centers on the battle between England and Napoleon’s French army. As in our own history, the English navy reigns supreme, but the twist in Novik’s universe is the existence of dragons: intelligent, powerful, flying creatures that pair up with human riders and form a powerful air force that turns the tides of battles and the course of history. The book starts out with a naval battle and an English ship captain, and after the battle is concluded, the English captain captures a rare dragon egg headed for France; before they can return to port (where the dragon hatchling could be paired with an appropriate “aviator”), the egg hatches and the dragon chooses Captain Laurence as its human companion. At first, Laurence is despondent (the sailors each had drawn lots for who would be forced to give up their entire lives to live in isolation as a dragon rider), but he quickly comes to realize what an intelligent and extraordinary companion the dragon, which he names Temeraire, is. The story continues through the growth of Temeraire into a large, powerful, agile, and extraordinarily intelligent dragon. The bond between Laurence and Temeraire quickly becomes unbreakable, and Laurence joins the cadre of aviators and brings Temeraire into battle against Napoleon and the forces of France. I enjoyed the book very much. Temeraire becomes a fascinating character, and the human-dragon interaction that permeates the book makes for a fascinating “what if?” scenario. The intricacies of dragon combat (including the dragon’s chosen captain and a crew of aviators who attach themselves to the dragon’s harness and help out in battle) are interesting and well-done. There are numerous types of dragons detailed, each of different size and speed, and some of which have powerful abilities like being able to spit acid or breathe fire. As you can imagine, the dragons are powerful military weapons, and shape the course of the war. While I enjoyed the book and the main characters (Temeraire and Laurence), I didn’t find the story particularly groundbreaking or original. The dragons were as you would expect: intelligent, noble, awe-inspiring creatures, who bond with humans and are capable of human speech (from birth!). Captain Laurence is bold, honorable, and likable, almost to a fault. While he is originally conflicted over leaving his fiancee and naval career, experiencing life with Temeraire quickly (as you would expect) converts Laurence into Temeraire’s closest friend and soulmate. I found that aspect of the book a bit predictable — of course he’s going to fall in love with being a dragon rider! Who wouldn’t? In fact, that premise (that most of us secretly wish for the splendor and adventure of befriending and riding a dragon) is the whole reason the book is so likable. It’s an enjoyable escape and a scenario that’s quite a bit of fun to imagine. The book was well-written, with few or no typos, grammatical issues, or formatting quirks on the Kindle version I read. There was a good combination of action, human drama, and a touch of historical military strategy. The pace of the book was good, as even the “slower” parts (without action or battles) kept my attention as Temeraire grew and matured and the bond between dragon and human grew. Ultimately, the book served as a good escape, a fun diversion, and a peek into the possibility of living among dragons in all their incredible majesty. Overall, I’d rate the book 8 / 10, and look forward to reading more in the series. For anyone looking for a solid dragon adventure with a bit of an alternate history / military twist, you will probably enjoy this one quite a bit. His Majesty’s Dragon is currently $6.39 on the Kindle Store, although I nabbed it when it was free a couple of months ago (presumably, Random House / Del Rey planned to get readers hooked on book 1 so they’d buy the remainder of the series). It currently averages 4.5 stars (out of 5) over 340 Amazon reviews, which is excellent. One note: the publisher blocks the text-to-speech feature, although they do not currently support the agency pricing model. The story begins 50,000 years in our own past, with the human captain of the Imperium starship Dahak in the midst of a mutiny. Realizing he can’t fend off the mutineers, he orders the advanced computer running the ship to give a countdown, then release deadly radiation into the ship, forcing all the mutineers off the ship — and killing himself in the process. He also orders the computer to destroy any mutineers trying to return to the ship before his loyal crew members restore control. His plan removes everyone from the ship, but the mutineers have sabotaged Dahak and left it too helpless to retrieve the loyal crew members’ lifeboats, but with automated systems that will destroy the mutineers’ warships if they come close. So the mutineers and other crew members descend to a nearby planet named Earth where they populate the planet. With the aid of “stasis fields” and bio-enhanced longevity, they mostly sleep through a 50,000-year stalemate. Dahak rebuilds itself, but is stuck between its captain’s last command to suppress the mutiny and the prerogative not to destroy half the Earth while doing so. Fast-forward 50,000 years, and humanity’s recent forays to the moon — did we mention that Dahak is a “planetoid,” a stupendously colossal starship somehow posing as Earth’s moon for all these millennia? — enable Dahak to capture Colin MacIntyre, an astronaut and descendant of Dahak’s loyalists from so many years ago. Thus begins the battle between Dahak (commanded now by Colin) and the mutineers. The first book chronicles the fight against the mutineers; the second follows humanity’s attempts to contact the remainder of the Imperium and fight off the advances of a hostile alien race; the third book details a madman trying to take over the new government. I really enjoyed the first two books. While I found the premise a little implausible (our moon is actually a giant, camouflaged, unimaginably powerful, semi-sentient starship waiting 50,000 years to suppress a long-dead mutiny? ), there was plenty of action and I enjoyed some of the philosophical questions a semi-sentient computer posed. In fact, as the book went on, Dahak quickly progressed to full sentience, to the point where it could think on its own, make decisions, philosophize, and tell the difference between right and wrong (even if it did lack a bit in human intuition). It even learns to feel emotions, and becomes one of the main characters in the story. The second book was probably my favorite — it focuses much more on space combat and the threat of a destructive alien race. The characters from the first book grow and take on positions of power in the new unified Earth government that must race to catch up to the “Imperial” technology of Dahak before the aliens arrive in a couple of years. It’s a story of combat and strategy and individual bravery, with the survival of Earth at stake. There is plenty of tension and a surprise twist at the end. The third book, unfortunately, fell apart a bit for me. First of all, the conflict is wholly internal, and the thought of so much mayhem and death being sown by one crazy human just doesn’t appeal to me as much as the idea of a threat from a warlike alien species. Also, I knew with 100% certainty the identity of “Mister X” (yes, that’s what he’s referred to) literally the first time he was introduced. (Big hint: he’s the only new guy in a position of power that wasn’t a proven veteran from the first two books.) Therefore, the book lost most of its punch, and I found it hard to believe this guy could orchestrate so many things that obviously required the highest levels of clearance (like destroying an entire planetoid starship by sabotage and killing 80,000 people) — and all the smartest people on the planet and this super-smart sentient Dahak never even ONCE considered him as a suspect … to the point where they put him in charge of the operation to find himself. Ugh. The other glaring problem with the third book was that Weber stuck a whole extra book in the middle of it. Weber is clearly a military history buff (like his book 1633, which detailed pre-industrial battles of pikes and cavalry and cannons — but with the twist of modern technology thrown in to tip the scales). However, this book suffers from a bad case of Weber exulting in his hobby: the book is twice the length of the previous two, and at least half is taken up by a side adventure of the main characters’ young adult children marooned on a primitive planet … and details how they use modern ideas and technology to raise an army and tip the scales in fights against pikes and cavalry and cannons. (Sound familiar?) A one-chapter diversion may have been OK … but this is a whole BOOK with detailed accounts of multiple battles — an entire campaign, actually — and I just found myself wanting to get back to the “real” action and finding out what was happening in the main storyline. The whole thing just felt like a huge pointless diversion, and out of place in the book I thought I was reading. I think Weber is at his best when he’s describing epic space battles and tactics — I’m personally less interested in the pre-industrial footmen and artillery battles he likes so much, which is part of why I didn’t finish 1633. But his space battles are done very well, and I enjoy the epic scope of his stories, the heroism of his characters, and the moral issues he often grapples with … which isn’t surprising, since those are elements I use in my own books. I’ve heard Weber’s works described as “hard sci-fi” with a focus on detailed science and technology, but that’s not really the case (I’d call most of his books “military sci-fi”). In this series, Weber mentions “gravitonics,” “Enchanch drives,” “warp grenades,” “hyperspace,” and other science-fiction hand-waving … and it doesn’t bother me a bit. Weber simply gives something a cool name, tells us what it does, and doesn’t bother with pages of pseudo-scientific “explanation” for technologies that humanity’s best minds don’t know how to create and that might even be impossible. The important thing to me is how he USES his technological framework to advance the story, play out large space fleet battles, and place his characters in dramatic situations, and Weber does that very well (there are a couple of minor problems, like heroes dodging laser beams). I do have to admit that I found the idea of a monstrous “planetoid” starship orbiting Earth and passing, undetected, as our moon for millennia hard to swallow. All in all, I’d recommend the series, with the huge caveat that half of the third book seemed extraneous (if you feel the same, I’d recommend you skip all the side-story chapters, as I wish I had — there’s not even a satisfying payoff at the end to make it worthwhile). I’d give Mutineer’s Moon 7 out of 10, The Armageddon Inheritance 8 / 10, and Heirs of Empire only 4 / 10. I’ve been meaning to start reviewing some books and movies that I enjoy on this blog, which has so far mostly concentrated on e-book news, e-book readers, and changes in the publishing industry. While I’m still passionate about those things, I’d also like to help spread the word and review other books I’ve been reading and particularly good movies I’ve seen. Sadly, in finishing my latest book (and editing, formatting, promoting, blah blah), I haven’t had much time for reading, but I plan to get back to it soon. The Hitchhiker’s Guide to the Galaxy series, by Douglas Adams: I’ve read this series of books cover-to-cover at least 5 times. Hilarious, witty, irreverent, poignant, and sometimes just plain silly, this book always manages to make me laugh. Aside from writing about funny situations and ideas, Adams was the greatest at using language itself to make me laugh; he wrote about funny things in a funny way. Some of his dialogue was pure genius. I’m saddened that he left us far too soon. Lamb, by Christopher Moore: Another example of great humor writing, Lamb was so sacrilegious, it probably would have started a new round of Crusades, except it had all the zealots doubled over and howling in laughter. It chronicles “the missing years” of Jesus Christ’s young adult life, and tells the story of his childhood companion, Biff. A taste: as Moore re-tells the famous story of the adulteress (inviting “he who is without sin to cast the first stone”), Biff gallantly volunteers to see the nice lady home safely. Jesus gives Biff a disapproving look that probably only the Son of God can really pull off. As Biff sulks away from the departing woman, he laments that “it just seems like such a waste of a perfectly good adulteress.” Comedy gold. The Conqueror’s Trilogy, by Timothy Zahn: This series hooked me in with a stunning scene of first contact with an alien species — which served as inspiration for the start of Right Ascension — and continued to explore fascinating ideas regarding assumptions we’d make about a new species and how changes in ability or technology could radically reshape an entire civilization and their viewpoint. The first book is from the humans’ point of view, the second from the aliens’, and the third goes back and forth. Zahn’s characterization and the depth of the alien society he created made it seem as if he had visited this alien place and come back to report on it, instead of inventing it in his mind. I could just as easily recommend his Thrawn series (set in the Star Wars universe) or many of his other excellent novels. Honorable Mentions: The Incarnations of Immortality series by Piers Anthony, Memoirs of a Geisha by Arthur Golden, and anything by Dave Barry. Forrest Gump: This is the movie I’ve watched more than any other. I probably saw it about 100 times in college, to the point where I could recite every line, and knew obscure trivia like dollar amounts or all the different ways you could prepare shrimp. Partially from overload, I haven’t seen it in years now, but I was still moved by the story and how the title character overcame obstacles and made his place in the world. The Shawshank Redemption: I was surprised to learn that this movie was based on a novella by Stephen King, Rita Hayworth and the Shawshank Redemption. I found this movie to be powerful, moving, and it contained the perfect combination of outstanding acting (Morgan Freeman and Tim Robbins), phenomenal directing, and a superb musical score. This may be the only movie I enjoyed more than in book form — which I’m sure was only possible because they fit all the essential stuff from the novella into the movie, which is impossible with longer novels. Serenity: Oh man, just don’t get me started on Firefly, the foundation for Serenity and the best TV show of my generation, which was cancelled in less than a season so they could squeeze in another version of Surviving the Amazing Apprentice Race with Real Kardashian Housewives. The TV series and movie were witty, well-written, and starred a great cast with phenomenal chemistry, led by Nathan Fillion, who I’m happy to see doing well on one of my favorite recent shows, Castle. Honorable Mentions: Several of the Star Trek: The Next Generation movies (and TV series), Top Gun (hey, all males my age liked that movie when it came out! ), and Rain Man. So, there you have it, some of my all-time favorite books and movies. Please don’t read too much into the exact order, the point is just that I very much enjoyed and highly recommend everything on this list.